Americans Living and Traveling Abroad - From USA.gov. Anglinfo - Your guide to living and working abroad. Provides comprehensive, up to date guides, services and products across 30 countries. Average Internet Speeds By Country - This interactive global map shows average internet speeds by country. Hover over a country to reveal the average internet speed. Click on a link in the index to see top 10 fastest internet speeds by average, for specific global regions. Best Web Sites for Embassies, Visas, Passports and Work Permits - Links provided by Transitions Abroad. Britains Living Abroad - Provided by UK's Directgov. Catalonian Properties - Estate agent for properites in Spain. Catalonian Properties are based in the south of Catalonia, just outside the small village of L'Ampolla, renowned for its fishing, marina and blue flag sandy beaches. Century21 (C21): International - Century 21 properties and agents around the world. Christie's International Real Estate - A global network offering exclusive home and luxury real estate services to buyers and sellers worldwide. City Mayors - Examines how the city mayors who govern the world's cities deal with today's urban issues. In its section Urban Statistics, City Mayors ranks the world's largest as well as richest cities and urban areas. It also ranks the cities in individual countries, and provides a list of the capital cities of some 200 sovereign countries. Engel & Völkers - International real estate and yachts on offer. EscapeArtist - Overseas properties, expatriate resources, international employment & offshore financial services. Expat Blog - Worldwide living abroad website, made by expatriates, for expatriates. ExpatExchange - Advice for expats, country forums and expatriate resources for moving overseas, international jobs, international living, international real estate, culture shock, expat clubs and local expatriate events. FusedWorld - International real estate directory and property listings with vacation rentals, homes for sale by owner, agent or developer. FusedWorld specializes in connecting property seekers and buyers to property owners world-wide. Global Property Guide - A site for residential property investors who want to buy houses or apartments in other countries. Green-Acres - Offer privates or agency handled properties for sale in France. Italian Luxury Asset - Whether you are looking for a villa along the beach, a country house, a resort or even a castle, Italian Luxury Asset is your one stop place. Also, find tips about buying a property in Italy. Just Landed - Offers information and services for expatriates - making your expat life easier, cheaper and generally more enjoyable. Leading Real Estate Companies of the World (LeadingRE) - A global network of over 600 premier real estate firms with 5,000 offices and 150,000 sales associates in 35 countries around the world. Living Abroad in Canada - Information about living, working, going to school, or retiring in Canada. Luxury Real Estate: Global Divisions - Luxury Real Estate is an international network with more than 60 countries representing the finest residential luxury estates and property brokerages in the world. Each selected member has been recognized as a leader in the marketing of distinctive and luxury properties, committed to high performance, professionalism and quality service. New York Times: International Real Estate - Luxury homes for sale outside the United States. Numbeo - Provides current and timely information on world living conditions including cost of living, housing indicators, health care, traffic, crime and pollution. Overseas Security Advisory Council (OSAC) - Global security news and reports. Peru This Week - English-language resource for those interested in living, working, traveling, and investing in Peru. PlanetPads.com - International property listings for people who wish to buy homes overseas. Practical Spain - Practical advice for living in Spain. Information on property purchase and residency, health care, cars and driving, working in Spain, public services, climate, the Land Grab Law, NIE/NIF documentation, and emigrating to Spain. RE/MAX - Connects you to international regions around the globe. With a few clicks of your mouse, you'll be transported to island getaways, European villas, Aussie lofts and more. RE/MAX is a global network, with a presence in more than 70 countries on six continents. Rightmove - Properties for sale in UK, Europe, the Americas, and Asia. Security Guidelines for American Families Living Abroad - An Overseas Security Advisory Council report. Sotheby's International Realty - Real estate network offering luxury homes, estates and properties for sale throughout the world. Tips for Traveling Abroad - From U.S. Department of State. Also see Living Abroad page. Top Frequently Asked Questions for Aliens and U.S. Citizens Living Abroad - From U.S. Internal Revenue Service (IRS). Top Properties: International Real Estate Sales and Rentals - Real Estate listings sold by owner or real estate agents worldwide. Listings by type, price, number of bedrooms and location. Advanced or quick search facilities can find you fast the property you are looking to buy within your budget or even at bargain prices. Find homes for sale, houses, apartments, condos, villas, cottages and other real estate such as land, building plots, farms and commercial properties like shops, warehouses or factories. Also, listings for sale of vacation properties, including hotels, motels, holiday apartments or B&B. Each listing includes detailed information posted by owners who want to sell their property. 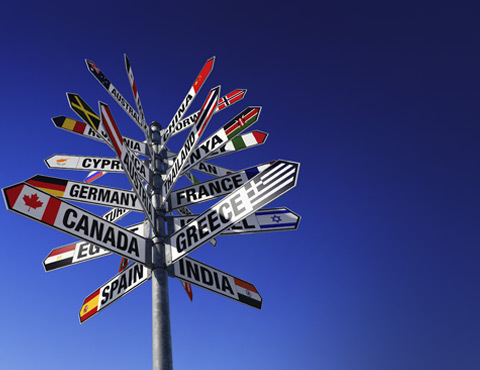 Transitions Abroad - Portal for paid and volunteer work abroad, living abroad, study abroad and cultural travel overseas. Also see Living Abroad by Country and Accomodations Abroad: The Portal for Bed and Breakfasts to Home Rentals to Real Estate Overseas. Travelling and Living Abroad - Travel advice and tips for British travellers on staying safe abroad and what help the Foreign and Commonwealth Office (FCO) can provide if something goes wrong. WorldProperties.com - The official web site of the International Consortium of Real Estate Associations (ICREA). ICREA helps consumers understand the global market business practices and can assist both buyers and sellers. Using online resources, buyers and sellers can learn about how real estate is transacted in the country of interest, so they are prepared for the differences from the practice in their home country. Buyers can search for properties among more than 3 million listings, and locate a broker who will work in a cooperative manner with a broker in another country to ensure the best possible service. Sellers can locate a broker who will market their properties to a worldwide market. This is especially important for sellers with distinctive properties that will attract buyers from around the globe in search of a vacation, resort, or luxury property, or simply one that's unique within its local market. Zoopla - UK's most comprehensive property website. England, Scotland, Wales, Northern Ireland; but also, overseas. This webpage last updated on Friday, August 25, 2017 2:36 PM.